To celebrate the 65th year of the Tall Ships Races and Regattas, we’re delighted to announce our return to the Baltic Sea. Between 27 June and 3 August 2021, the international Tall Ships fleet will visit five countries for a series of races and spectacular maritime celebrations. The Tall Ships Races 2021 will take the majestic Tall Ships fleet back to the Baltic Sea for the first time since 2017. During our last visit, over four million visitors came to see the Tall Ships, and we’re sure that 2021 will be just as successful. The event will start on Sunday 27 June and continue through until Tuesday 3 August with three fantastic races and a Cruise-in-Company. The race series will take the Tall Ships to five different ports across five countries – Klaipeda in Lithuania, St Petersburg in Russia, Tallinn in Estonia, Mariehamn in Åland and Szczecin in Poland. Head of Race Directorate, Paul Bishop, provided a few details about what can be expected during the different race legs of the event. “The Tall Ships Races 2021 offers a total of around 1,500 nautical miles of racing in the Baltic Sea. This region has been a popular sea area with Tall Ships from around the world, with up to 100 vessels taking part in previous Baltic race series. 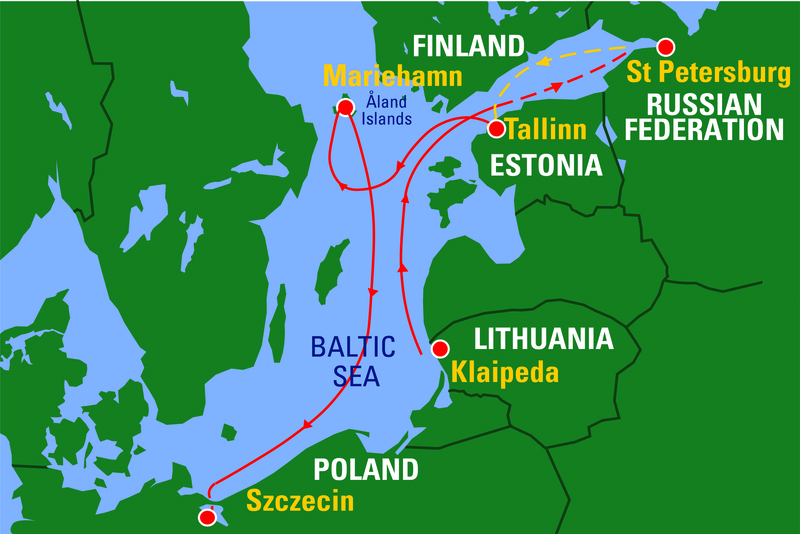 “Race One will start in Klaipeda and finish off the coast of Estonia before transiting into the historic port of St Petersburg. A Cruise-in-Company will then follow amongst the beautiful Finnish archipelago to the Hanseatic port of Tallinn. This will be the first time since Tallinn has hosted The Tall Ships Races since 1992. “Race Two will take the fleet around a series of challenging waypoints before finishing in Mariehamn which is steeped in maritime heritage. Race Three will be the longest race leg south to Szczecin, the final host port in the race series. Klaipeda is the third-largest and oldest city in Lithuania. It’s situated on the Baltic Sea, is the country’s biggest port, and it’s one of the only ice-free ports in northern Europe. It first hosted the Tall Ships Races in 2009, and it’s quickly becoming a regular fixture in the sail training calendar. The port’s new passenger cruise terminal has helped bring increased traffic to the area and make the Lithuanian city a true tourist attraction. “This is exceptionally good news to Klaipeda. We are glad that Klaipeda has met the expectations of the international community and proved that we can welcome huge international events and create a fantastic festival for hundreds of thousands of people. Saint Petersburg lies on the east of the Baltic Sea and is famous throughout the world for its maritime history, international festivals and rich cultural heritage. Founded in 1703, the city enjoys a landmark cultural status with numerous significant historical and cultural landmarks and is on the UNESCO World Heritage List. Tallinn, the capital of Estonia, is located on the southern coast of the Gulf of Finland and is home to one of the best preserved medieval cities in Europe, which is recognised as a UNESCO World Heritage Site. The city is the political, financial, cultural and educational centre of Estonia and proved to be an irresistible attraction for the Tall Ships Fleet in 2017 when over 44 ships chose to visit the city during the Cruise-in-Company leg of the event. Located in Åland, an autonomous collection of islands at the entrance to the Gulf of Bothnia, the town of Mariehamn is no stranger to Tall Ships events. It’s rich maritime history is married with a warm and welcoming nature from its 11,000 inhabitants and visitors can expect a relaxed and picturesque town to explore some of the best nature the Baltic region has to offer. Szczecin is one of the largest cities in the north of Poland. It’s known as Poland’s “green city of ecology” and it’s famous for its yachting. It was the final port for the Tall Ships Races in 2007, 2013, 2015 and 2017 where over two million people came to see the world’s magnificent Tall Ships during the event. This fantastic race series will offer a wide range of festivities, attractions and crew activities during Europe’s largest, free, family festival. All of which is sure to make the 65th instalment of the Tall Ships Races event a truly unforgettable experience.